Photography is the medium that best expresses my observations and travel experiences. My work is not limited to any specific category. They are pictures of people, places and things that have touched me in some emotional, intellectual and whimsical way. 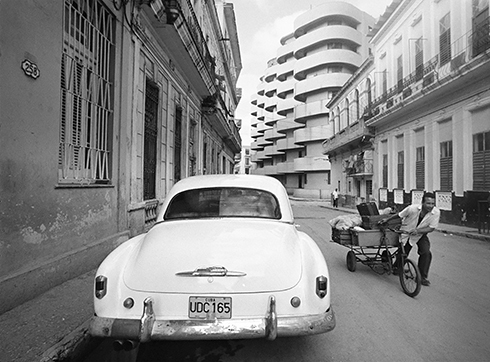 The creative process for making photographs is the same, whether I am on the street in Boston, documenting daily life in Cuba or an airplane factory in Shanghai. I observe the human condition as it unfolds before me, attempting to capture that telling moment of people interacting or the juxtaposition of people in their environment. The process is a combination of thinking, intuition and anticipation of the subject; that is, I think about the angle and position to shoot from, the composition of the subject, and the light conditions. It seems to all come together in a nanosecond. Henri Cartier-Bresson referred to it as the “decisive moment.” For me a “finished piece” can be a single image or a series of photographs that best sums up the story that evokes a reaction. It resonates with the viewer.